Thank you very much for your great article . in point number one we similar problem. we have an MRI machine that is shared between Cardiac PACS and Radiology PACS with two worklist provider. 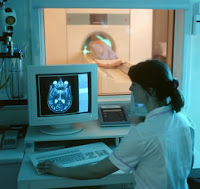 when we tried to connect the machine we found out that the MRI machine will accept only one work-list server. at the end we had to connect to one worklist server. Do you have batter idea or a suggestion to fix like these issue? thank again for the great article. maybe it is possible to send the HL7 orders to your interface engine and let them forward all cardiology MR orders to the radiology broker and all others to cardiology. If you don't have access to your interface engine, you might consider installing a lite-weight open source interface engine such as Mirth which you can program yourself. RE:4- Every worklist I have configured we purposely avoid posting a specific station AETITLE to the worklist. The scanners pointing to them have the AETITLE tag removed from the query constraints since often it cannot be determined which scanner will be taking the images. Globally, if applied, devices will see orders for "today" for their modality type only and the tech will be able to see ALL associated orders on any similar modality. Example: If a cardiac unit has 4 US portables, how would you pre-determine which US would be available for a given order and patient? RE: 6 - Only recently I have seen NextGen not have the modality type available in the order messages (OBR24). Currently handling this with an interface engine map of procedures (ie - maintenance). What other HIS/RIS have you seen w/o? Is this standard? RE: 9 - some worklist brokers allow configuration of query constraint controls by modality AETITLE. HL7 can be used to set the order status to COMPLETE from INCOMPLETE when an ORM SC is received with status of "Exam Ended" onward for example. The worklist broker identifies the modality by AETITLE in the dicom query, and adds "INCOMPLETE orders only" to the query constraints, effectively removing orders that now have images and no longer need to show up on the worklist. BIG institutions with 1000 orders/day or more for all modalities need this since the dicom worklist on the modality has limitations on how many orders it can display at a time. 4: agree that in some cases you do NOT want to schedule by AE-Title, however, in some case you DO, and that is what I wanted to point out. 6: OBR24 is "diagnostic service section" and typically encoded with a department identifier, e.g. "RA" for radiology. Mapping procedures into "modality codes" is what I typically have seen. 9. Yes, but setting the order status to "complete" is mostly triggered by a user action, MPPS is automatically sent by the modality (if configured) and therefore often preferred. its a very important notes and post . RE 6 : I think that its possible to add the modality type/machine name on the HL7 OBR (18 to 20)which are free filler and placer filed and can be mapped to the required customized filed . interesting article as i read this thank you so much I am very happy to visit here. I read here the latest Blog $1 web hosting Godaddy is the best plan to get your website online. thank you. Here you will find best keylogger for android. It is totally amazing blog I really Found this article cool catch webhostingonedollar is one of the best way to create this. I am really grateful to have such a long informative article about this DICOM topic as I was searching for answers to many DICOM related questions. You post covered almost all of them so that I am quiet excited to have them all in a single post. Thanks again for such a great post about the online DICOM viewer and its usage.